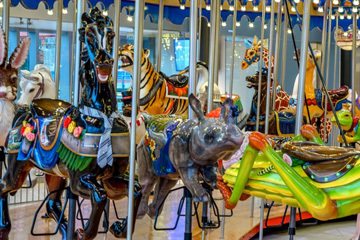 Convenient parking is available for Carol Ann's Carousel in Smale Riverfront Park. Refer to the map for more information on parking or to reserve a guaranteed space online. Carol Ann's Carousel is an amazing work of art by Jonathan Queen featuring 44 Cincinnati-centric characters. The carousel includes panels depicting animal characters playing in one of the numerous Cincinnati parks, and panels of the many historic landmarks in Cincinnati. The carousel is housed inside a glass building and operates year-round.